Bethora looked out the station window, waiting for the race to begin. The windows here in the royal quarters were quite expansive, far more so than in most other sections of the station, and gave a good view of both the planet below and of the stars in the distance. The glass in the windows was warm, too, which was rare on space stations. Microscopic filaments embedded in the glass generated a constant supply of heat, and the material in the windows was specially mixed to conduct it well. The heat loss through this process was horrendous, and so it was only offered to the richest of clients. The comfort wasn't solely for the benefit of visiting royalty. As part of the Ardishapur family, Bethora frequently had to play host to a number of tradesmen, merchants and religious officials, most of whom regularly visited the space station but wouldn't go to the planet's surface. Travels between planet and station were expensive if you wanted any degree of comfort, and while the royal court could get the most comfortable seats free of charge, anyone else would either have to pay, or accept being stowed away like so much cargo and livestock. So Bethora went up to the sky on a regular basis. She enjoyed it. Things were simpler here, she found, and offered opportunity for reflection and quiet. This time around, the retinue even included her son, who was about to compete in the space races. She turned from the window and looked to the royal banners hanging from the walls, decorated with the Amarrian crest and the various sigils of her family. The banners swayed a little, gently wafted by air conditioners discreetly planted in the walls behind them. Beneath the banners stood the royal furniture, old and splendid: chairs of thick, dark oak, covered in embroidered pillows; various old paper books on shelves, chronicling the family history; gold and silver cutlery and dishware. The last was being polished by Javies, Bethora's manservant, who mumbled genteel obscenities about the state of the place and the competence of the staff. Javies was part of Bethora's retinue, and went with her on all official trips. They routinely visited the space station, and every time, he expressed his astonishment at the lackadaisical attitude the staff onboard seemed to have towards basic cleanliness. The silverware, he maintained, looked like it had been stored in a coalmine, and the less said about the dust on the tables, the better. Bethora, who was in most other respects a strict and proper person, didn't begrudge Javies his little complaints. The man had been in service to her family for a long time, and had assisted willingly in various tasks that younger men would have begged leave from. He knew when it was all right to talk, and when one should remain silent. Bethora looked back out the window, staring at the planet. She heard Javies's footsteps approach. "Brings us closer to the Lord, milady?" he asked. "Brings me further from the earth, Javies." "I do wish they'd get this thing over and done with." Javies handed her a thin porcelain cup, and poured tea into it. "Milady has never been much in favour of the races, as I recall. Incidentally, I took the liberty of cleaning the tea kettle. Three times, in fact. I believe it had gathered enough carbon to form the basis of intelligent life." She glanced at him and smiled briefly. "Thank you, Javies. It's always good to have a diversion." "Indeed, milady." Javies retreated to the dinner table, where he began to polish the gold decoration on the glass cups. "I just don't like Keral taking time away from his studies," Bethora said. "He needs to work hard." "The children of men can never rest, it seems, milady," Javies said, alluding gently to the status of Keral's father. The man had been a notoriously hard worker, right until his untimely death. Afterwards, Bethora had grown increasingly dissatisfied with Keral's progress, constantly egging and pushing him to greater heights. "It's for his own good," Bethora said. "Life isn't easy." Javies, who had been a manservant for a long time and knew a few things about the difference between royal and civilian life, said nothing. "Besides, if his father were here, he'd push the boy far harder." "I'm sure he would, milady." There was a knock. Javies walked over to the door and greeted the guest, saying to Bethora, "Lady Raana here to see you, milady." The woman walked in. She wore a dress of shimmering greens, and a golden necklace, both of which glimmered in the lights of the quarter. She walked speedily over to Bethora, gave her a nervous smile and said, "Bater sends his regards." Bethora nodded. Bater was Raana's husband, a man with sad eyes and clammy hands. Bethora had let him on top of her once, in a weak moment, and had told him afterwards that if anyone ever found out, she would have him castrated. "Have you heard from Keral?" Raana added. "Only that he was getting ready, and expected to win. How about Selan?" Selan was Raana's son, and would be aboard the same ship as Keral in the race, acting as Keral's second-in-command. "The same. I do wish those boys weren't so eager. Competitiveness is all well and good, but one day they're going to take it too far." "Rather that than not far enough," Bethora said. "Oh, don't say that. I'm worried enough as it is without having them be jinxed." Javies interrupted. "I'm sorry, but could I offer miladies some tea?" "No, thank you, dear," Raana responded. "I only popped round to wish everyone good luck." "And the same to you," Bethora said. She put her arm around Raana's shoulders. "They're going to be fine. Stop worrying. I didn't raise Keral to let me down." Raana looked at her. "I know you didn't, darling," she said. "I know you didn't. At any rate, I'll be off. The race should be starting soon, anyway." And with that, she took her leave. Several ships undocked. Each was a different model, but shared the Amarrian characteristics: The lambent gleam on golden hulls, the hawk-like curves, the quiet, majestic grandeur. They lined up in a predetermined pocket of space and signed their readiness in the local communications channel. A few moments later, the judges gave the starting call. The race was on. The rules were fairly simple. Each contestant had to destroy a series of beacons. Each beacon, when destroyed, would drop a marker that needed to be returned to station. Points of varying measure were scored by destroying your beacon, returning your markers, destroying other people's beacons, destroying or returning their markers, and performing any particular manoeuvres considered elegant, flashy or dangerous enough. All beacons were fairly closely spaced, so there was always a risk that your opponent might shoot down yours instead of going for his own. As a result, ships needed to be fitted not only with sufficient firepower to destroy the beacons, but also electronic warfare capabilities to disrupt the targeting capabilities of other players. Not only that, but since each marker was fairly sizeable, you'd need to fit cargohold expanders on your ship if you wanted to haul more than a couple back to station at any one time; and expanders would slow your ship down noticeably. Ship setups were kept strictly secret, shown only to professional inspectors. Keral was already in the lead. He'd spent months practicing with Selan at his side, and the two commanded their ship with admirable precision. 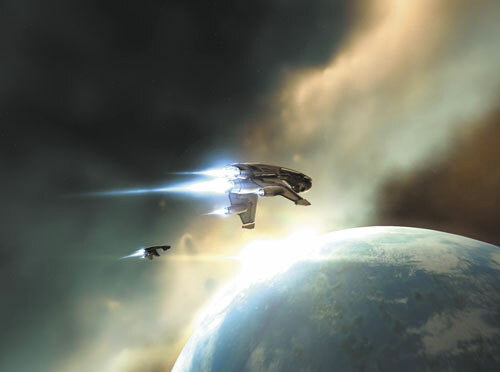 Since the purpose of competition was to test the young men's mastery of command, the ships were staffed only by regular crews, not by capsuleer pilots. Eventually, it came down to a single beacon. Keral and Selan's ship, the Apollyon, was just barely ahead, racing toe to toe with another ship. The Apollyon started going faster, and faster, and faster still, firing on the beacon and hitting with incredible accuracy at that range. It managed to destroy the beacon, but for some reason its guns kept firing, into empty space, and a commentator noted that if they kept that up something was sure to burn out. The Apollyon rushed onward to pick up the marker, but when it got in range, it didn't slow; instead, it kept going, overshooting its prize. It tried to turn, but inertia had it in an inexorable grip, and as the spectators watched in shock, it crashed into a nearby asteroid. They were at the station's medical quarters. Bethora sat by her son's side, in silence. He was being kept unconscious. His friend Selan had died earlier the same night. The head doctor approached her. "The scan results are in, milady. I'm very sorry to tell you this, but with the internal injuries your son has sustained, it's almost certain that he won't last the night." He continued. "We'll do everything we can to make your stay here as comfortable as possible-"
"There is something else you can do," she said. "You can help my son." "I'm sorry," the doctor said, "I truly am. I can understand your reaction, but short of giving him a new body, we're helpless. I strongly suggest you focus instead on the little time you have left with your son." Without breaking her gaze, Bethora got up and stood very close to the doctor. "You are not listening to me," she said in a quiet tone. "Or yourself. There is something you can do. A new body." The doctor stared at her. Then he bubbled, "That's, no, that's unheard of. Amarr royal skin is absolutely sacred." "If my son dies tonight," she said, "he will not be the only one. Nor will I stop there. Is that clear?" The doctor swallowed, and nodded. "I know there are several facilities in the area with clones on standby. My manservant will assist you in making the necessary arrangements, including all steps needed for secrecy. My son will awake tomorrow, and make a miraculous recovery." Bethora looked through the shatterproof window set in the door. It was a week after the accident. On the other side, Keral paced, tossing things back and forth, screaming nonsensical dialogue from movies he'd once seen, stopping every now and then to turn the lights in the room off and back on. He had indeed made a miraculous recovery, but not a complete one. Brain damage, irreparable, had ensued. Her advisors had informed Bethora she would have to keep her son out of sight for a while. Later, they would let rumours slip out that the crash, combined with Bethora's harsh, cold treatment of her son throughout his childhood, had resulted in such psychological trauma that Keral might never recover. No one could ever find out that the cloning of sacred Amarrian skin had taken place, nor that, with security procedures circumvented, it had gone so disastrously wrong. Bethora placed her fingers against the glass. Her son, lost in whirlwinds, didn't even notice. Bethora turned. In front of her stood Raana, accompanied by two armed guards. "Why did the ship go faster than its fittings should've allowed?" Raana said in a dead tone. "Why did its guns keep on firing at nothing? Why didn't its shields buffer it from the asteroid? Why did my son die?" Bethora rubbed her eyes. "I don't know. Why don't you go ahead and tell me, Raana?" "I had the wreckage investigated," Raana said. "Turns out it contained ship rig prototypes. Since rigs are so new on the market, they haven't yet been allowed in competition, but your son didn't care about that, did he?" "What are you saying?" Bethora said. "The first prototypes for these things wouldn't have shown up on the ship fitting screens, and so the inspector would never know. But they were completely unstable and were never released to the public. The only people who could've gotten their hands on those infernal machines were those with special access. People like us. "Your boy had this planned for ages. He cheated, and it killed my son, and it was all because of you." "Who pushed him into this? Who never let up? Who made him feel he was never good enough for anything?" Raana said. "I don't know if you actively encouraged him to cheat, but it really doesn't matter. You're responsible for all of this, Bethora, and I intend to see you pay." She raised a hand, and the guards stepped forward. Bethora steeled herself. "You don't know what you're doing," she said. Raana's eyes went wide and her face turned pale with rage. "And you do?" she said. She stalked over to Bethora and jabbed a finger at the window on the door beside them. "Look! Look at what you've done! You wouldn't even let that poor boy rest in death." "What do you mean?" Bethora managed to say. "You know exactly what I mean. It doesn't take a genius to figure out," Raana said, then shook her head. "My god, you're pathetic." Bethora opened her mouth to say something, thought the better of it, and walked past Raana, the guards following her with hands on their weapons. On the other side of the door, the boy turned the lights on and off, on and off, on and off, on and off, on and off.